The only way to keep up an Investing For Retirement program is to automate the investment process. Ideally, your employer will make the investment for you. This is the best scenario in that you don’t ever even see the money that gets invested. It doesn’t show in you paycheck, it is not in your checking account, it is already working for you once you even think about making an investment. Next best scenario? Most (all? Probably all) online brokers will automatically withdraw funds from your checking account and purchase stocks/funds that you have preselected. Using this technique, monthly automated investment will trigger one of the most powerful investing mechanisms – dollar cost averaging. Dollar Cost Averaging describes what happens when you make periodic investments regardless of what the price of the security is doing. If the price of the security is down, you get more shares for a given level of investment. If the price of the security is up, then each share you bought at a lower price is now worth more. Continuing to invest, even when the price of your security is tanking, will eventually lead to you to “Buy Low, Sell High“! This is the ONLY way for most investors to achieve that nirvana. The example below shows that you make money even though the price of the security in question falls to half its initial value and then comes back, but only to the original price. 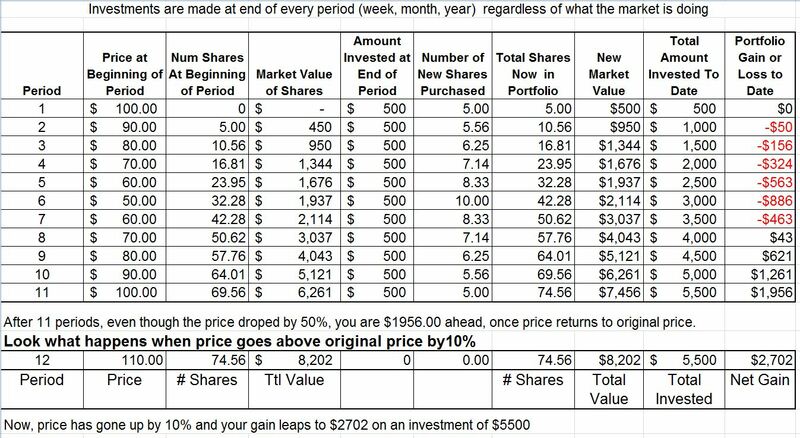 Now, all those shares that you purchased for $70, $60, $50 are worth $110. Aren’t you glad you continued to purchase even when the market was tanking? The above chart is powerful evidence that continuing to purchase securities, regardless of what the price of the security is a fool-proof technique. This assumes that your security is not a stock of a single company that could go out of business. The “Investing For Retirement™” guarantee of Buy Low, Sell High only applies if the security is one that tends to move with the direction of the general market. It works well for index funds and broad based mutual funds. The technique does not work for individual stocks like those shown below.